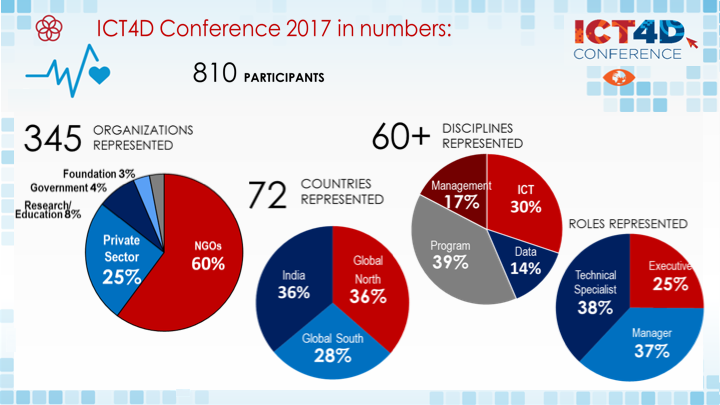 The ninth ICT4D Conference in Hyderabad, India focused on how technology solutions are helping to harness the power of data to accelerate the achievement of the United Nation’s Sustainable Development Goals (SDGs). The conference spanned four days, comprising plenary sessions in the mornings featuring leaders from a cross section of organizations and discussing the following key themes: the impact of digital transformation on development; innovations in data visualization and analytics; enablers and barriers to open data sharing; and frontier solutions and their contribution to meeting the SDGs. Following the plenary sessions, the audience chose from 20-25 parallel breakout sessions organized into seven different tracks (agriculture and environment, health, education & livelihoods, disaster management, digital financial inclusion, data-driven adaptation, and partnerships & cross-sector solutions) plus an invitation-only Executive session focused on the impact of the new world order on the development sector. Over one-third of the participants spoke in one or more of these sessions. The conference was opened by KT Rama Rao, the Minister of IT of Telangana Government, and over four days featured a launch of the Big Data platform by the CGIAR group, various workshop sessions and practical discussions, and the fourth day included birds-of-a-feather sessions (interactive group discussions) and concluded with announcements of the winners of the ICT4D Data Jam Awards, a hackathon organized prior to the conference, and the map gallery. The exhibit hall featured the work or solutions of 35 organizations and offered opportunities to engage with the eight conference media partners and local press. Overall, 80% of the participants rated the conference very good or excellent and 66% rated it as being a lot or great deal of value for the money. Participants cited the diversity and quality of conference participants and speakers, the range and diversity of conference topics, the opportunities the conference provided for networking, learning and knowledge exchange as well as interaction and problem solving, its focus on practical applications of ICT to issues, and the conference venue, time keeping, and layout of the exhibit hall as the top things they liked about the conference. 10 non-governmental, and private sector organizations partnered and donated labor to organize this year’s conference: Anudip Foundation, Catholic Relief Services, Dalberg, DIAL (Digital Impact Alliance), Esri (Environmental Systems Research Institute), ICRISAT (International Crops Research Institute for the Semi-Arid Tropics), iMerit Technology Services, Mercy Corps, NetHope, and World Vision. 20 conference sponsors: Catholic Relief Services, Microsoft, World Vision, CGIAR (Consultative Group on International Agricultural Research), Google Earth Outreach, aWhere/ GDA, Government of Telangana, , Dalberg, Digital Globe, Esri, Oxfam, RTI International, AMZ/ GPC Group, Cyient, DIAL, DuPont, Radiant Earth. And 19 exhibitors: Centre for Good Governance, Software Group, Robert Bosch, Notre Dame Initiative for Global Development, Mobenzi, Thought Folks, Open Systems, Vecna Cares, Akvo, Diona, Centre for Digital Financial Inclusion, iTech Mission, Vera Solutions, DanOffice, D-Tree, One Mobile Projector Per Trainer, Quest Alliance, CABI, Vodaphone.